Knit out of a lovely laceweight alpaca with a new color work technique, Verdant creates a new sort of colored lightweight fabric. 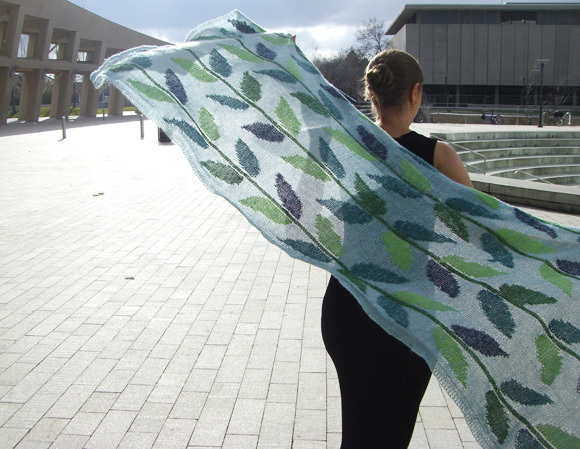 Held up to the summer sun, this wrap casts a leafy shadow. As with fine printed cotton and lovely old woven shawls, a shadowy but perfectly presentable version of the right side image is visible on the reverse. Laceweight yarn knit at a loose gauge is translucent, and in this way light is added to the knitter's palette. In this wrap, just as in stained glass, light shines around and through the leaf motif. This shawl is knit using a techique of my own that I think of as Blended Intarsia. I have been experimenting with blended intarsia for over a year because, although I love the large graphic qualities of traditional intarsia, I prefer sophisticated color relationships. The contrasting or sometimes discordant colors of commercially dyed yarns can be harmonized with this technique to create an entirely personal palette suited to the knitter. 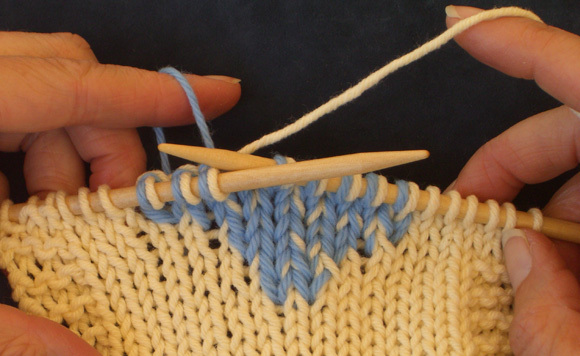 Blended intarsia may look like traditional intarsia, but the knitter is freed from the tedious and tangly task of twisting yarns at color edges. 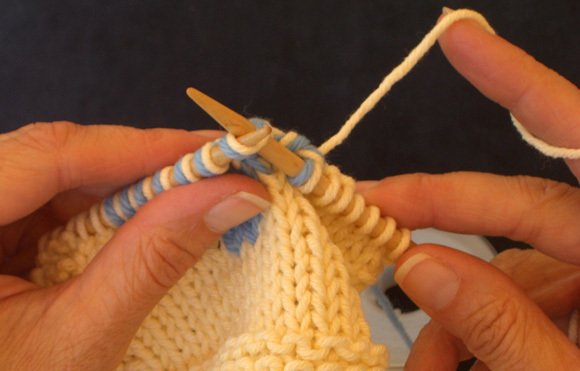 For the first few rows, this technique will seem awkward whether the knitter is an advanced beginner or very experienced. The only unusual skill required is a willingness to form some stitches with an unfamiliar hand. This new technique is explained in an illustrated notes section. 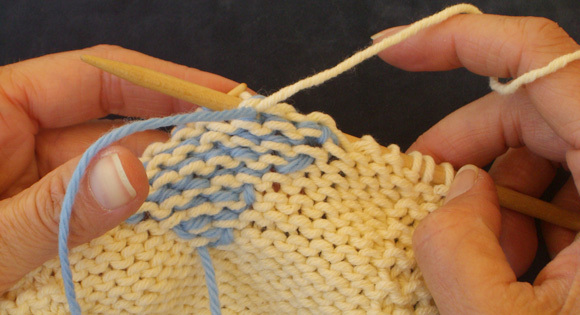 The technique for aligning the colors side by side on each stitch may seem fiddly at first, but very soon it becomes second nature. Familiarity with provisional cast on and some experience in chart reading are helpful. Please be relaxed about following the chart. If you make a small error on a leaf, step back and look at it before ripping out. Leaves come in all shapes and sizes. If the design is still pleasing, let it be. For this intarsia pattern, consider the chart a suggestion rather than a commandment. Note: Exact gauge is not important for this project, though it is important to achieve a light, drapey, open fabric. Work a swatch, including some portion in blended intarsia, and block the swatch to ensure that the resulting fabric has the desired qualities. To make a wrap the same size as the one shown, it is necessary to achieve the gauge given. Work a swatch 20 sts wide and 40 rows deep, including some portion in blended intarsia. Swatch should easily stretch to 4.75 inches wide and 5 inches deep during wet blocking. This wrap is worked in two halves, beginning with a provisional cast on. 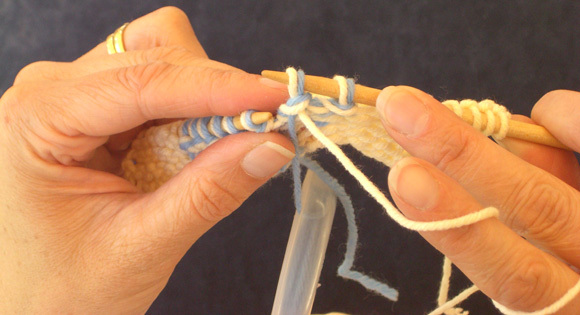 After the first half is worked, the provisional cast on is removed, and the second half is worked from the resulting live stitches. For this project, all sts of chart pattern are worked in stockinette st using MC; CC sts are worked using both MC and CC (see below). MC is not worked using bobbins, as all sts are worked using same strand of MC. The photos and instructions below describe the method for working blended intarsia in a way that results in the CC yarn usually being predominant on the RS of the work, and the MC yarn being predominant on the WS of the work. This will make the design bolder on the RS of the fabric than on the WS. Don't be discouraged if you find that the technique requires some practice! If you find that this way of working is not feasible for you, it is still possible to make this project; simply work CC sts using 1 strand each of MC and CC held together. RS of fabric will show more color blending between MC and CC than in wrap shown. Use a separate bobbin for each stem and leaf, even when a leaf is worked in the same color as the stem. Bobbins will hang on WS of work when not in use. It is not necessary to twist strands of yarn around each other at color changes as in conventional intarsia. When following chart, work MC sts using 1 strand MC. Work CC sts (blended sts) using 1 strand MC and 1 strand CC, as follows. 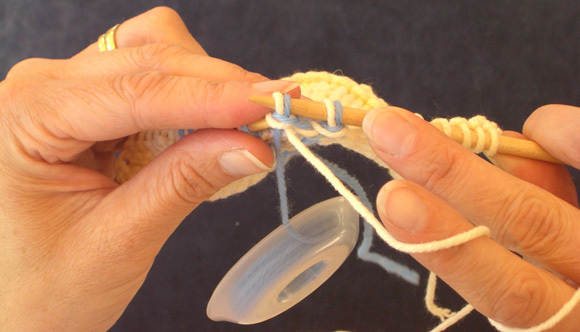 Note that in the directions that follow, “throw” will refer to wrapping yarn around right needle using right hand, and “pick” will refer to using tip of left needle to pick up strand of yarn from left hand. You may find it unnecessary to tension CC strand around fingers; the weight of the bobbin will often provide enough tension that the CC strand can just be hung over one finger. Working blended sts on RS rows: Hold MC using right hand and CC using left hand. 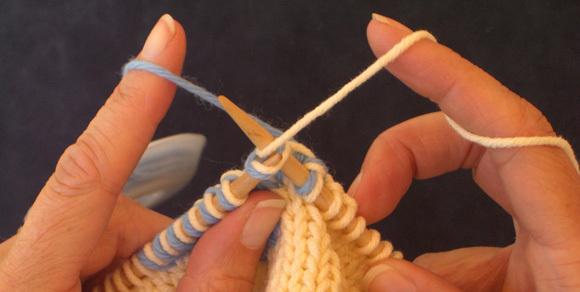 Insert right needle knitwise into st, throw MC using right hand, pick CC using left hand. 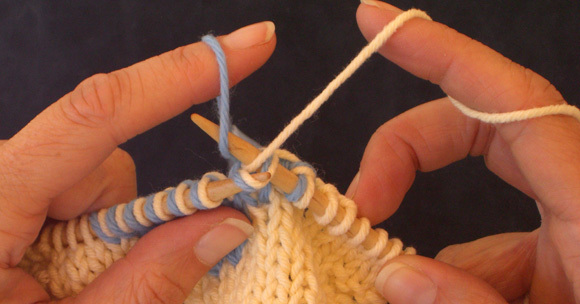 Draw right needle through st on left needle, completing st using both strands of yarn. Most of the time, MC strand will sit to right of CC strand on needle on RS rows, and to left of CC strand on WS rows. Don't worry if this is reversed on some sts. Working blended sts on WS rows: Hold MC using right hand and CC using left hand. Insert right needle purlwise into st, wrap CC strand over needle using left hand, throw MC strand using right hand. 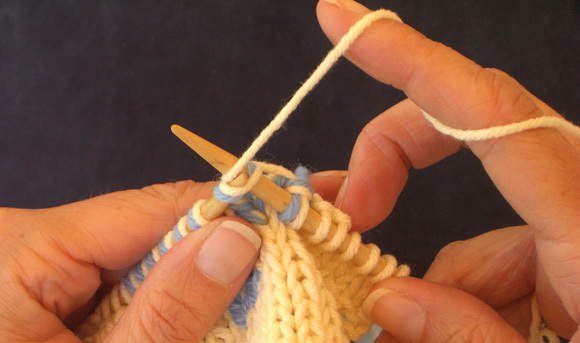 Draw right needle through st on left needle, completing st using both strands of yarn. Leave a yarn tail approx. 4 inches long at beginning and end of each block of color. 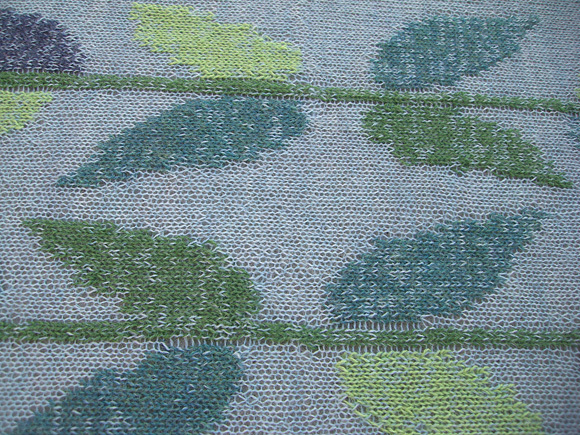 When beginning a new ball of MC, join new end within a leaf motif; this will make it easier to weave in ends invisibly. When the chart indicates that the first blended st falls to the right or left of the last blended st worked in the previous row, take care to avoid pulling CC strand tightly or leaving a large loop of CC on WS of work. The strand should lie loosely against WS of fabric. 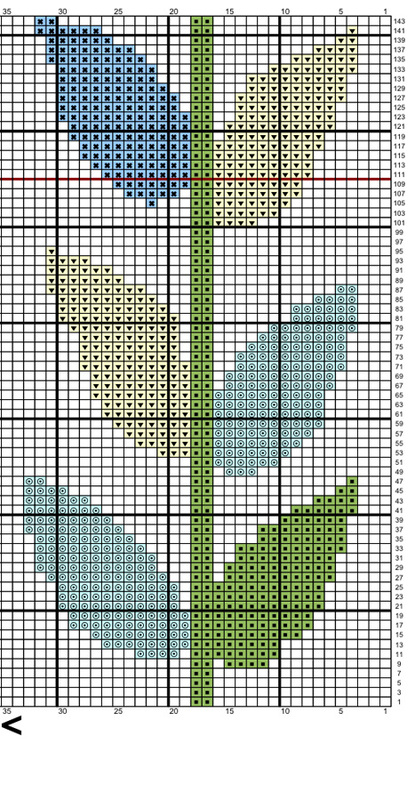 The chart for this pattern is very large and fits on 2 letter-sized pages. Click here and here print the resulting pages. Assemble them with the arrows [ >< ] touching. Using provisional method and waste yarn, CO 146 sts. Row 1 [RS]: Using MC, k6, place marker, work Row 1 of chart, place marker, work Row 1 of chart once more, place marker, k6. IMPORTANT: Each row of chart indicates pattern for two rows: a RS row and a WS row. RS row numbers are indicated along right side of chart, WS row numbers are indicated along left side. Next Row: Sl 1, k5, work next row of chart as set, k6. Continue in pattern as set, maintaining 6 sts at each edge in garter st and slipping first st of each row, until you have completed all rows of chart. Work Rows 1-144 of chart once more, EXCEPT once you have completed Row 110 (indicated by red line), discontinue working stems – work stem sts indicated using MC only. 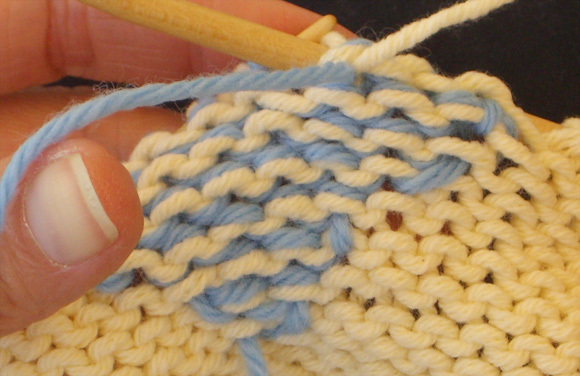 Using MC only, work 2 rows in stockinette st, maintaining garter st borders as set. K 12 rows, slipping first st of each row. BO all sts very loosely. Carefully remove waste yarn from CO edge, placing resulting live sts on needle. Count sts; you may have 145 sts instead of 146. If this happens, increase 1 st after working garter st border at beginning of first row, and count increased st as first st of chart. Join MC with RS facing. When working first row, leave longer tails than usual when joining each stem bobbin. When working stem sts in first row, insert tip of right needle into front of st below st on needle, so that new st is drawn through both st on needle and st below. This will help to disguise the slight jog that may result between stem from first half and stem from second half. 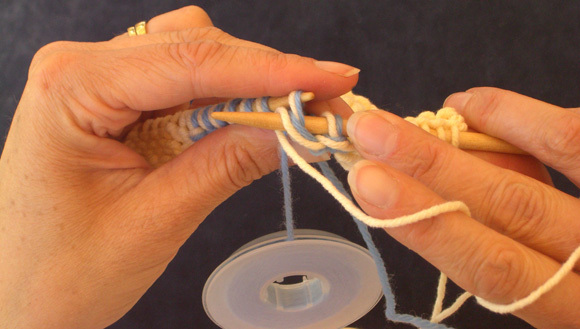 If there is still a visible jog, it can be disguised when weaving in ends. Work as for first half. Weave in ends on WS of work, weaving loosely to prevent fabric from binding during blocking. Wet block, using blocking wires if desired. Do not stretch wrap too much while blocking, or leaf image will be distorted. Susan Newhall taught herself to knit long, long ago in the olden days of sl 1 k1 psso. Now, eons later, in the enlightened days of ssk, Susan has taken up designing. She designs patterns for Belfast Mini-Mills in Prince Edward Island, Canada showcasing their beautiful yarn, and occasionally writes a pattern for her lys or Ravelry. All of this creative work takes place while she parents kids, stepkids and a dog so large that she suspects it’s a cleverly disguised pony. Susan is on Ravelry and is known there as Suebell.